As I write we are coming to the end of our first Valentine’s Day celebration in the United States, and celebrate we have. To be honest it is very hard not to celebrate Valentine’s Day here, surrounded as we are by so many references to it. Even though he was in New Zealand, Richard made sure I was not forgotten by Saint Valentine. All the advertising we have seen of late has been saturated with hearts, love, flowers and cupids; many of the homes in our neighbourhood have been flying Valentine themed flags; a whole section of Target was dubbed Valentopia and filled with Valentines paraphenalia; popular candy brands released special edition Valentines candy – pink and red m and m’s, raspberry flavoured Hershey kisses; even our supermarket was overflowing with heart balloons, flower displays, enormous boxes of chocolates and valentine making kits. 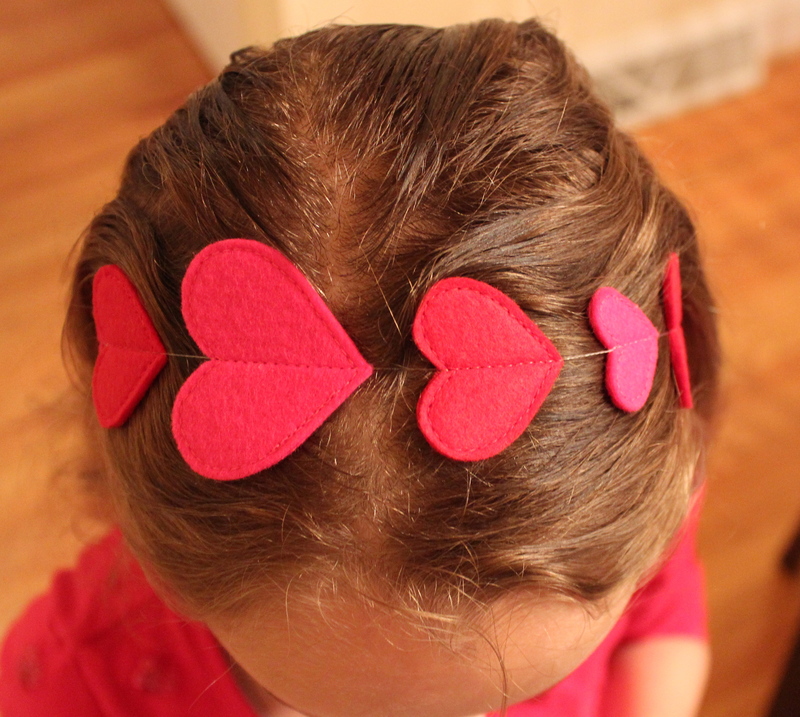 Hearts were everywhere – even in Olive and Edie’s hair! 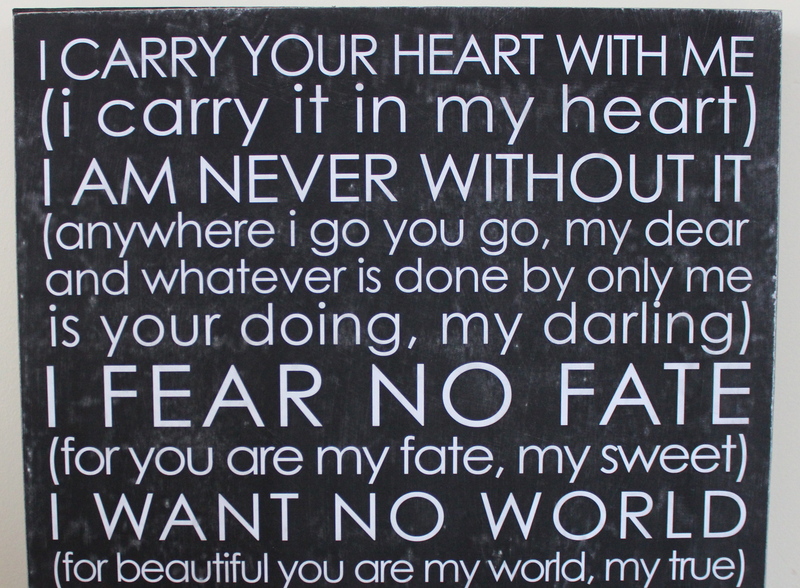 Whilst Valentine’s Day doesn’t pass by unnoticed in New Zealand, it is very much taken to a whole new level here. One of the biggest differences is the way children here really get in on the celebrations. When I was teaching I never once had my class take part in any Valentine themed activities and there was never any exchanging of Valentines. I have been out of New Zealand classrooms for some time now so things may be changing, but in American classrooms Valentine’s Day is a big deal. 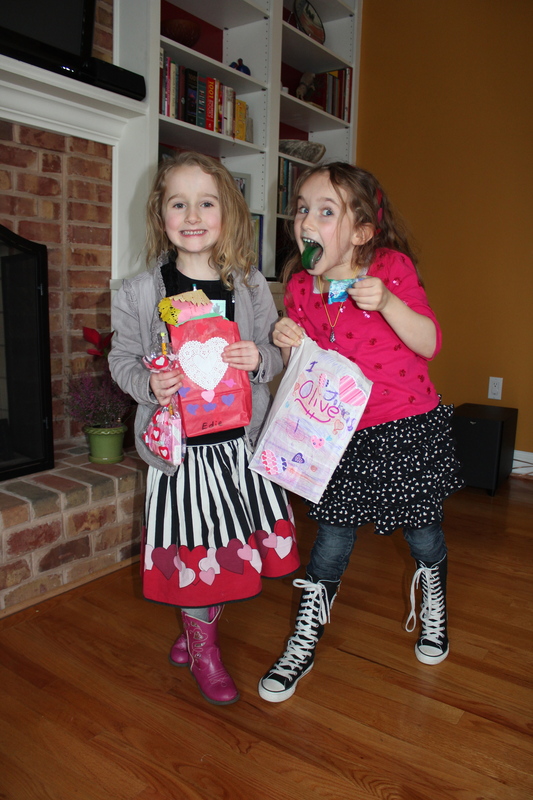 Both Olive and Edie had a day of treats, Valentine activities and of course the big Valentine exchange. 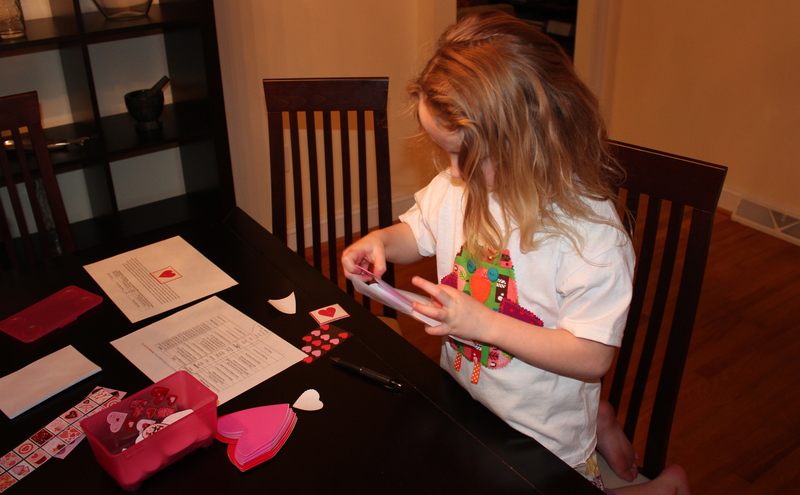 Despite the huge assortment of ready made Valentines for sale, I got the girls to make their own. Once again the Martha Stewart craft line came in very handy. All sealed and ready to go – the extra big one is for Olive’s teacher. Both girls took some treats to share with their classmates – could not resist these super cute cookie cutters. 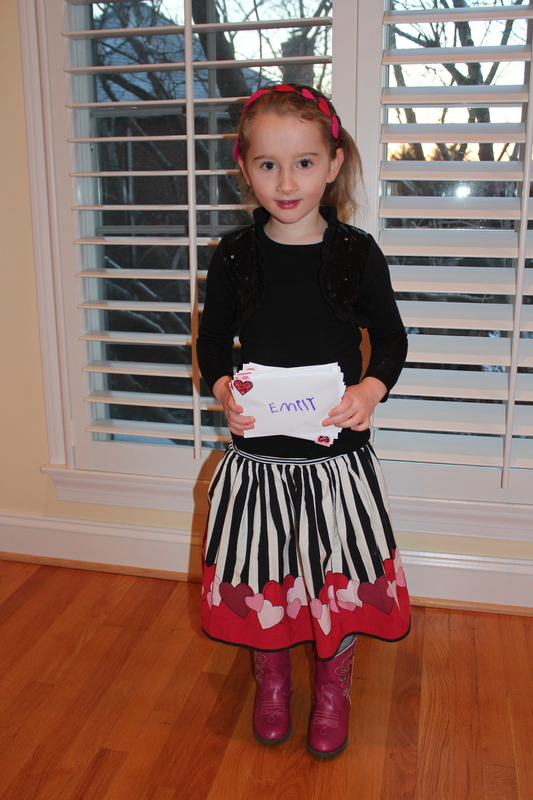 All the children were encouraged to wear hearts and the colour red. The perfect skirt for Saint Valentine. 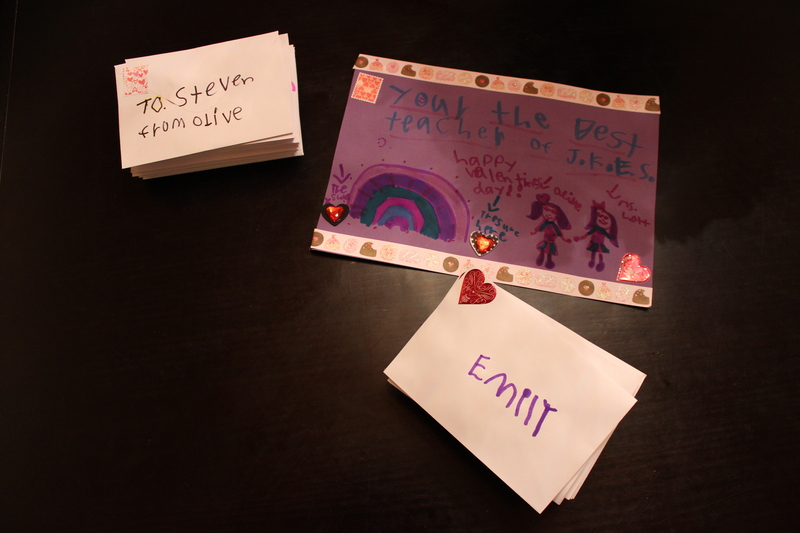 I helped out at Olive’s class Valentine party in the afternoon. The children played heart bingo, listened to a traditional Valentine’s folktale and shared their Valentines with each other. They were also asked to tell the class something that they loved or really liked. 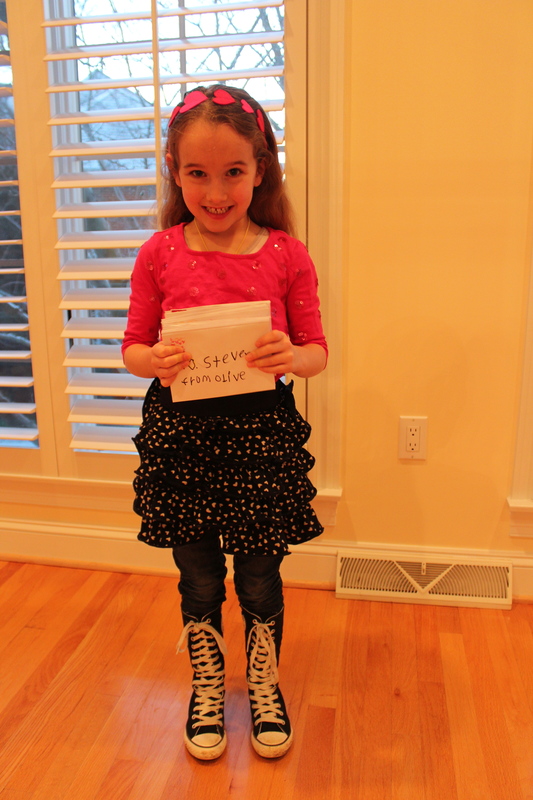 There were many answers along the lines of “my bike”, “angry birds” and “my nintendo DS”, but when it came to Olive, without pausing she said, “my sister”. Had to blink a few tears away after that! 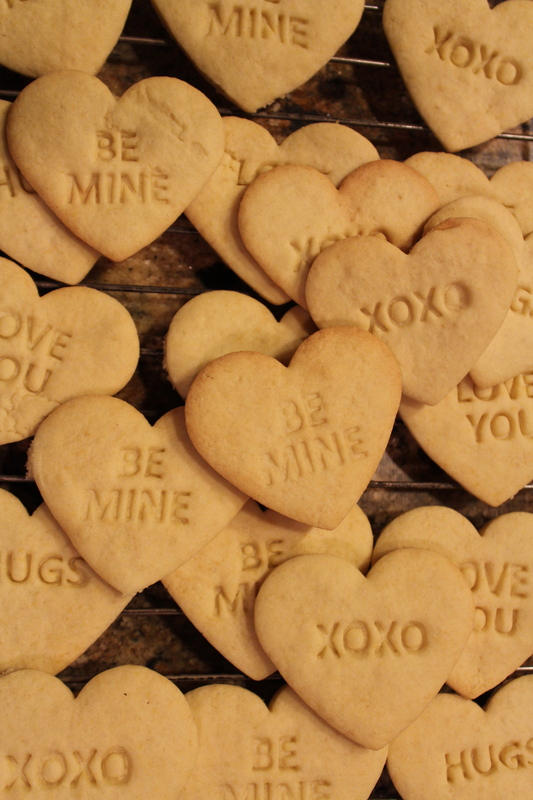 Check out our Valentine’s stash! PS quick quilt update if you are interested over at my How to make an American Quilt page. This is another tear jerking posts. Your girls are gorgeous as are your sentiments. My amazing family. 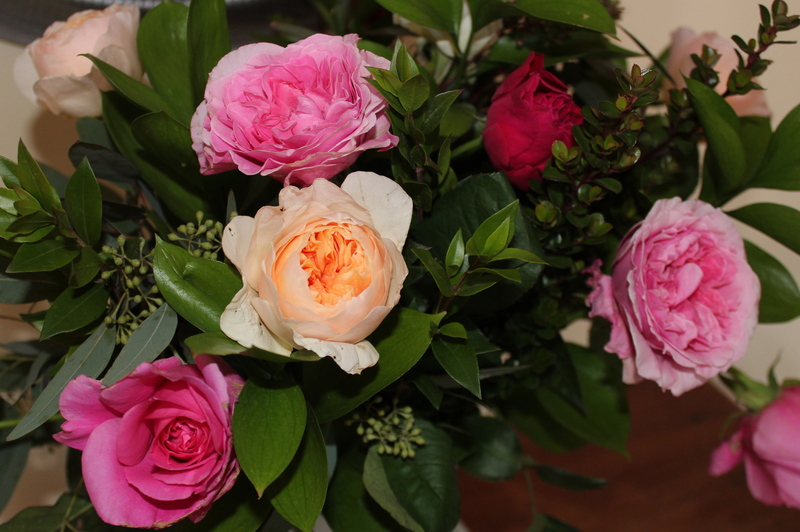 So glad you all had such a wonderful day – and if anybody is wondering the roses are a David Austin selection – worth every dime! Hi Helen. Thanks for including that historical info – was hoping to put that in my post but just got too tired so thank you! Hope you all enjoyed your Valentine’s Day.